Another month of 2016 is in the books and it is time once again to post our dividend income results. August was good month (which most usually are) for our portfolio. We didn’t set any new records. But we did take another small step towards building our portfolio by earning the most dividend income ever for the month of August. Compared to last year, we saw a huge percentage gain in our income which is detailed more below. Even though we did not set any new all time dividend records last month, it was still our best August on record. Our dividend income grew by over 25% from the same month last year. That is the kind of growth that I like to see as we are working to build our dividend income portfolio. 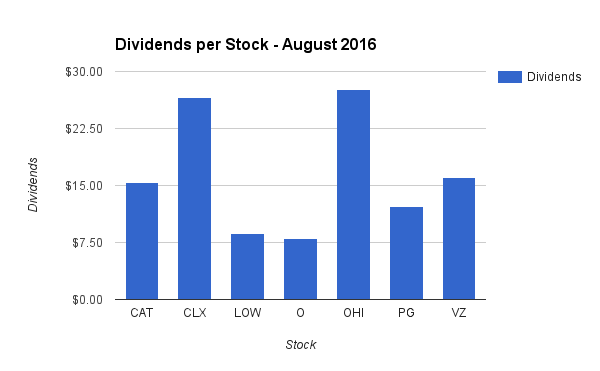 Only 7 of our stocks paid out a dividend in August, but that doesn’t mean it was a weak month. With great companies like Caterpillar, Clorox, Lowe’s, and Procter & Gamble – we know that August will always be a solid month for dividend income. We saw an increase of over 26% last month compared to August 2015! Months and months of investing new money has helped to increase our dividend income. For the first time in as long as I can remember – we did not invest any new money into the stock market last month. It is not that we didn’t want to. Over the summer, we took on a little more debt than I would have liked. Summer vacations and unexpected auto and home repairs depleated a lot of our extra cash. So while we try and invest as much new money as we can each month, the priority is to first not take on any long term debt. The money normally used to invest was instead used to pay off our bills. 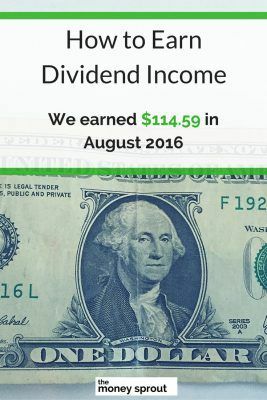 The dividend income earned in August ($114.59) was up over 25% from the same time last year. Despite not investing any new money into stocks last month – we still saw this increase. That is the beauty of investing in quality dividend stocks. They continue to work hard for you day and night – even when you are not around. Our goal for 2016 is to earn $2,250 in dividend income. To date, we have earned $1,136.24 in dividends for the year. At this point, we are on pace to earn a little over $1,700 in dividends for the year. It doesn’t look like we will hit our goal of $2,250 – so we are going to try and break the $2K mark at a minimum. 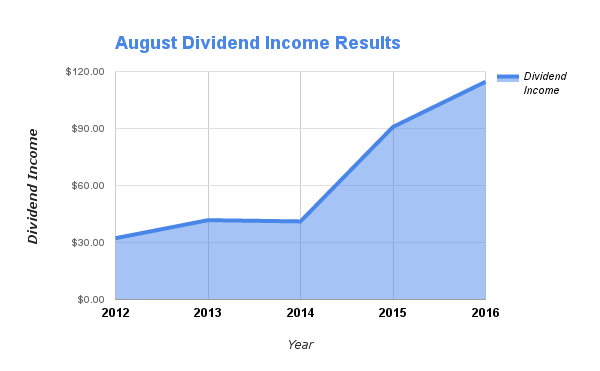 How was your dividend income in August? Full Disclosure – At the time of this writing, we owned shares in the following stocks noted in this post – CAT, CLX, LOW, O, OHI, PG, and VZ. The material above is not a recommendation to buy. Please do your own research on a company before deciding to invest.